This is from a long time Ubuntu user who recently picked up a MacBook Air for all the portability it has to offer. I am completely new to macOS. I had to look around and experiment to install all the packages I was enjoying on Ubuntu. I decided to put together a simple setup guide to get the deep learning environment (particularly for Computer Vision) up and running on macOS the easy way. I am documenting the process I followed to get things working. Some of the process may not be the efficient / optimized way but the goal here is to get the job done with minimal efforts / frustration. Someone coming from Ubuntu background, completely new to macOS, just want to set things up for deep learning and doesn’t want to feel “I wish I didn’t pick up a MacBook”. Following are the basic softwares/packages you need for deep learning. This is not an exhaustive list by any means. These are the basic things I work with for Computer Vision. Depending on your area of interest the list may vary. On Ubuntu, we all know that we can just go to the terminal and sudo apt-get install . But what’s the play here on macOS? It turns out that macOS is also a Unix based Operating System. So, luckily we have the same terminal we are all familiar with. But with some changes in the way we interact through commands. For example, instead of apt-get package manager we have brew (HomeBrew) here. I have seen people recommending to install Xcode (an IDE for developers from Apple) as the first thing to do. But I don’t think it’s absolutely necessary. I was running Python scripts fine without actually installing Xcode and also Xcode is a heavy piece of software to run. So, the bottom line is you will be pretty much fine without Xcode. /usr/bin/ruby -e “$(curl -	fsSL https://raw.githubusercontent.com/Homebrew/install/master/install)"
Open up Terminal and enter the above command. It will install brew and only the necessary xcode command line tools. This will install latest version of Python for you. You can check whether it’s correctly installed by typing python3 on the terminal. Virtual environment is a super useful tool to keep things clean and separate. All the Python packages you install will be virtually contained within a particular virtual environment you create and will not mess with the things outside. Trust me, this will save you a lot of frustration in future. 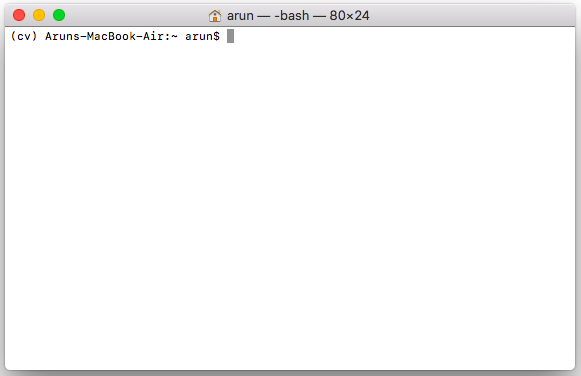 If you can’t find .bash_profile file in your home directory, you can create one. Add the following few lines and save the file. Now type source ~/.bash_profile on the terminal. Make sure it doesn’t throw any error. Now you are all set to create your first virtual environment. You can create as many virtual environments you want with any name you wish. Now you are inside the virtual environment cv . You can look for (cv) sign at the beginning of shell prompt. You can come out of the environment by typing deactivate and enter the environment by typing workon . Some of the dependencies ..
Before we start pip installing Python packages, let’s take care of some of the dependencies these packages have. Come out of the virtual environment by typing deactivate. This installs cmake which is needed for dlib. To display image outputs from opencv or dlib , we need to install X11. Download X11 from xquartz.org and install it by double clicking the downloaded file. Once it finishes installing you might want to logout and log back in. So, that’s it. Let’s get pip installing. Make sure the (cv) sign appears in the command line. Let’s install some of the pre-requisite/other useful packages. 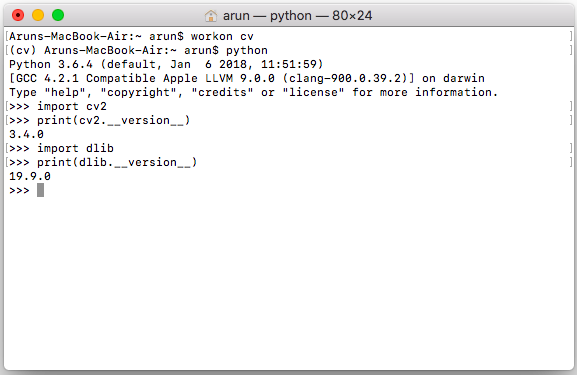 Note: opencv-python is a community supported package, not officially from OpenCV. It may be a bit slow since we are not compiling from source on our system. But this is the easiest way to get going. Keras is a very beginner-friendly deep learning library. It runs on top of tensorflow. You can build models very quickly using keras. Test all the packages installed by importing them. Type python on Terminal. It should give you the python shell. Import the packages one by one and check their version. Make sure you don’t face any error. If so, installation was not complete. We installed the basic packages/software needed for deep learning (particularly for computer vision) on macOS High Sierra the easiest way possible without dealing with much frustration. 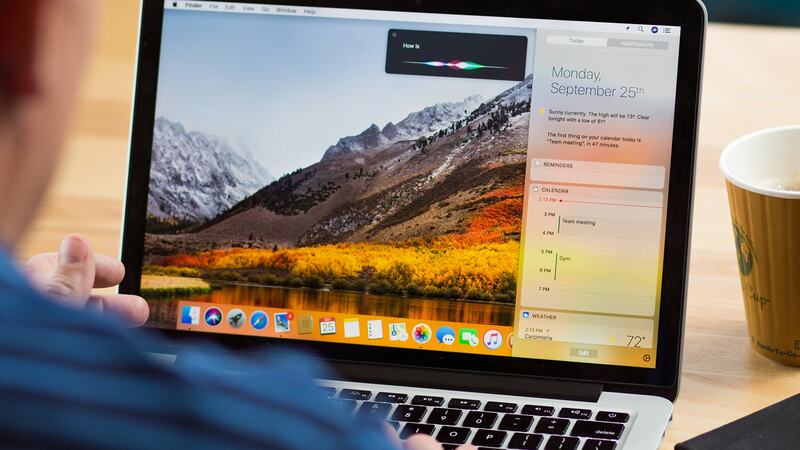 I hope this helps someone out there like me, getting started with macOS. Feel free to share your comments here or you can reach out to me on Twitter.